I have had a few beers of late. And I have had some jelly also. Today was the first time that I have ever had beer flavoured jelly. Or beer flavoured Jelly Belly jelly beans to be exact. A quick trip out of Napa with Thud and his three oldest children found us at the Jelly Belly Candy Company (located at One Jelly Belly Lane, Fairfield, of course). I just love seeing things being made and packaged (love bottling-time at TWWIAGE) and so I found the Jelly Belly factory very interesting. One can witness the entire jelly bean making process at this very busy production facility. We all had lots of fun, but at the same time learned a lot about food manufacturing. Perhaps in an attempt to attract more adults, Jelly Belly are now offering wine and chocolate pairings in a '21 and over' tasting room. 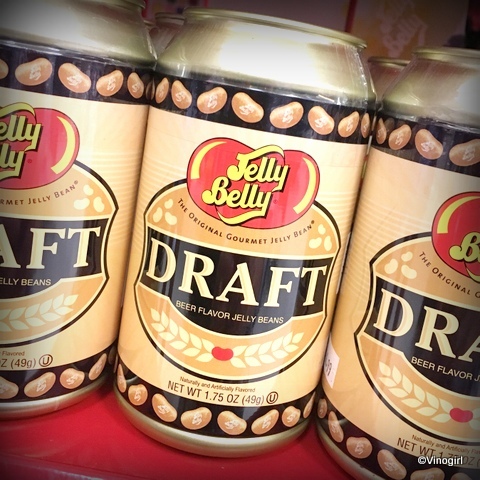 And grown-up jelly bean flavours like 'Champagne' and 'Draft Beer'. The champagne jelly beans tasted like stale, still white wine to me, but Thud thought the draft beer beans actually tasted like beer: my taste buds were not that convinced. Weird. I'll just stick with Juicy Pear, my favourite flavour. I have been very busy lately with family goings-on. A lot of driving has been necessary, so, consequently, I haven't really been drinking. I had one glass of wine last Friday night, which was my and Vinomaker's anniversary, an agreeable 2014 Chenin blanc from Vinum Cellars (Clarksburg AVA). I had half a glass of beer at the Main Street Reunion car show on Saturday. And on Sunday, in celebration of Thud's birthday, I had two bottles of beer; a bottle each of the Kona Brewing Company's Castaway IPA and Fire Rock pale ale. Both beers were very pleasant and paired well with the tasty BBQ fare on my plate. I'm not complaining, I'm having fun. This evening, my family and I are planning on throwing an Earthquake Party: it is two years since a rather angry temblor shook the Napa Valley to its roots. The little ones have suggested that we all eat jelly (Jello), popcorn and Pop Rocks. Kids! This afternoon, my family and I spent quite a bit of our time oohing and aahing (and at one point I think I may have even slobbered a tad) over a fabulous collection of classic American cars. Yes, the 2016 Main Street Reunion car show was held today in downtown Napa. I have said it before, and I'll say it again, I love this event; great automobiles, happy people, fabulous music (lots of Johnny Cash and Eddie Cochrane) playing loud. Love it! At the conclusion of the event we all lingered in one particular area to watch, and listen, as many of the cars and trucks fired up their engines and rolled out into the greater Napa Valley. Very impressive. One of my least favourite vineyard operations - installing the bird netting on the white grape varieties - was made more bearable today due to the fact that Vinomaker and I were assisted by Thud, two Vinonieces and one Vinonephew. It actually was a lot of fun; the little ones caught on quickly and were just the right height to apply the clothes pegs below the vines to secure the nets. I had a quick taste of some secondary clusters, that I removed as I worked my way down the rows, and I have to say my little grape-babies have quite a bit of flavour already. And the crop looks beautiful. I can sleep soundly tonight knowing that my grapes are safe from hungry birds. Thanks kids! For lunch today Vinomum and I decided to take a trip up the valley on the Napa Valley Wine Train. It is almost two years since we last rode on the wine train together. Last time we were on the train we basically had it all to ourselves, as lots of visitors to the valley had cancelled their reservations due to the very recent, and rather large, earthquake (that had rattled a lot of nerves) in August 2014. It was a perfectly gorgeous day for sitting back, enjoying the views and being waited on hand and foot - for three hours. I did not really have anything to drink, well, just a small glass of Chandon bubbles, because I was driving. But I sure ate a lot. A very enjoyable way to spend an afternoon. Another new book arrived in the post today. The book, The Land Remembers, is ostensibly a treatise on viticulture and terroir. However, my first impression, after a quick shufty through the book, is that this book is more about one man's love affair with his very own garden of Eden at Indian Springs Ranch, Kenwood (Sonoma Valley). George MacLeod and his family bought acreage back in 1974 without really knowing anything about winegrape growing, it seems. But he brought plenty of passion with him. If one is in doubt as to Mr. MacLeod's romance with the land, his inscription to me, at the front of the book, says,"To Vinogirl - Here is a true vineyard love story! With affection, George, grower". Case closed. The Land Remembers has some interesting sections on soil, topography and water, with accompanying charts and photographs - all the vine-geeky stuff I love. There is a short chapter on 'Microbial Terroir' which has really piqued my curiosity. I am really enjoying all the viticultural reading I have been doing of late. This book is a lovely addition to my humble reference library. The book was written with Arthur Dawson, and other contributors. One of the contributors is yours truly: yes, I contributed a photograph of a smudge pot (page 79). Ta da! That's my 15 minutes of fame done. I only bought this wine because Thud absolutely hated the whole concept of wine in an aluminium can. My dear brother generally doesn't like any beverage in a can; he much prefers beer, soda and wine packaged in glass bottles. He would can this can. I didn't have strong feelings one way or another about this packaging initially, but now I love it. 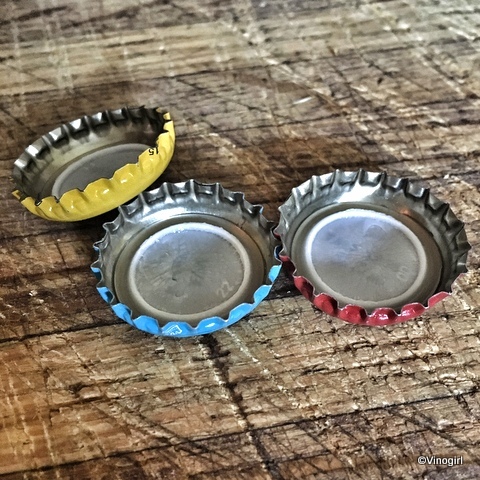 The can (produced by the Ball Corporation, better known for its jars) is just so convenient, it's less weight than glass and the wine seemed to chill better in aluminium. This can is possibly the perfect wine packaging for travelling, picnics, or just throwing one in your handbag. Purchased at Whole Foods for $4.97 (which would make this 375ml can a $10.00 bottle of wine), the Underwood Pinot gris, from the Union Wine Co., in Oregon, wasn't the greatest wine, but it made a pretty decent apéritif for three people. Searing lemon-drop acidity, which definitely knocked my 'Queen of Tart' crown off my head, dominated the palate, with a bit of Granny Smith-malic-acidy-zip thrown in for good measure. Clean, quite refreshing and with a hint of effervescence, I would try this wine again. I even like Union Wine Company's use of the social media metadata tag of #pinkiesdown with which they aim to take the pretension out of wine drinking. Fun. 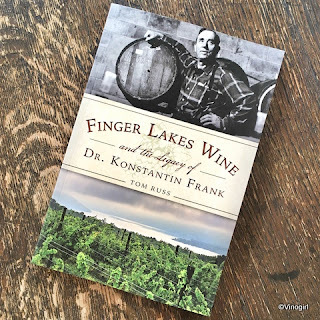 The next book, in my personal quest to understand more about the history of Vitis vinifera in the United States, is this book by Tom Russ: Finger Lakes Wine and the Legacy of Dr. Konstantin Frank. Dr. Frank was by all accounts a bit of a poop disturber; in that he tried to shake up the New York state wine industry by repeatedly insisting that V. vinifera, i.e., European winegrape varieties, could thrive in the eastern United States. It is in Dr. Frank's expertise as a viticulturalist, and his scientific approach to clonal selections, that I am mostly interested in. Yesterday was International Albariño Day. Yay! A few months ago I began my search for an Albariño that I might not have tried before. Then, just recently, in the Napa Register, I read of a new wine label, Eighty Four. Eighty Four is a new project by Elias Fernandez and Doug Shafer (of Shafer Vineyards). It just so happens that they produce an Albariño, so I thought it would be a good candidate with which to laud the upcoming festivity. I called Shafer to find out if the Albariño was available for sale to the general public (sometimes these faddy wines aren't). I was helped (and I say helped in the loosest possible sense of the word) by a woman who answered my questions with one syllable words only. Okey-dokey. I supposed she was just having a bad day. I had a similar experience when I drove up to Shafer on my day off. I wasn't greeted upon entering the winery although there was a person in the reception area. The gentleman, at a desk staring into his computer screen, only acknowledged me when I ventured, "Hello" in my cheeriest voice. I told him what I wanted, handed him my business card, I made some idle chit-chat and then paid for the wine (no inter-winery discount at Shafer, by the way). Our entire interaction was conducted with having barely any eye contact at all. He was that disinterested, very bizarre. I suppose all Shafer employees continually have bad days. The wine itself went something like this; the wine was very yellow in the glass; strong lemon and candy floss (cotton candy) on the nose; first sip was a little briny; the taste was of pineapple chunks and apple tarts (two sweets, candy, from my childhood). And the wine was very tart, like it had been acidulated with citric acid. Now, I consider myself the 'Queen of Tart' as I generally like an elevated acidity in my wine, but this was a little over the top. Overall the wine, whilst not unpleasant, seemed a little tired. It wasn't oxidised, but all that candied stuff going on just made the wine seem a little over-worked. An average wine, served with bad customer service, sigh. I can't get my $28.00 back, but I can make sure that I never spend another penny of my hard earned wages at Shafer. If one feels inclined to waste some time, one can read the Register article here. Enjoy. Or not.